If a medical facility was to receive a body for dissection then the remains would have shown signs of being dissected and not just one or two organs removed? If bodies for dissection were difficult to obtain would a medical facility obtain a body and not utilise it completely for dissection purposes? Dissection was to study muscles, bones, tendons etc. Why leave an arm or leg intact? A medical student could just as well study their own attached arm if they weren't going to dissect a limb? The three rare Thames related cases 87-89 all involved female bodies. From research I did at one workhouse which released bodies to hospitals etc. the majority of bodies acquired from the workhouse were males. Why then did the medical facility choose to only dump female bodies in the Thames and not the male ones acquired? Why were there no elderly bodies? I think the answer to your questions are quite simple, arms and legs would have been ten a penny for medical facilities there is not much about an arm and a leg to study as you rightly point out, so a need for disposal relatively untouched, both arms and leg can only be be removed in several ways, sawing and cutting around the joint as has been stated. You or I could do that and the results would not be dissimilar to that perhaps of an inexperienced medical student. Another point to consider is with regards to undertakers who were tasked with taking possession of the remains from medical facilities and burying them them, as i have stated it is not beyond the realms of possibility that they could dispose of the body parts thus keeping the money they were paid. As to more females than males again there is a simple explanation, a female body contains a number of organs that are not found in a male body, so why would they not take female bodies in preference to males as everything and more was to be found in a female body. And more importantly no heads were ever found, we have to ask why was that? was it because the heads were one of the most important and interesting parts of the anatomy to study? Taking all of these facts into consideration I again reiterate that I believe there are other plausible explanations for the torso body parts other than murder. But Jackson may not be relative to the topic, her intact body as it was, clearly did not make it to the mortuary, and was dismembered by person or person unknown, presumably those responsible for her death notice I use the term death and not the term murder. Not much to study on an arm and leg?? Start on page 64 of the London Dissector (link above). It talks about dissection of the thigh. It delves into anterior AND posterior dissection. It's several pages long on just the thigh. What about the foot, knee calf, etc. That is also discussed in other chapters. Each part of the body in the dissection room appears to be thoroughly cut apart and examined. As Debs said, muscles, tendons etc,etc. The parts of the torsos were in no way that thoroughly taken apart. Do you accept that there are other plausible explanations to these torsos other than murder? But that's just you going against the primary source material, Trevor. The verdict at the 2nd inquest was a verdict of murder. This would be consistent with a view that this was a domestic, part of a series or death related to abortion. I'm sure you're right, RJ. I think I have read the same thing. Great post, Jerry. My thought exactly. The torso wasn't placed "between two sleeping drunks", it was placed in an open archway leading to a stone-breaking yard. The drunks were sleeping in the next arch along, which was fenced off from the road and only accessible by going through the entrance arch and back into the adjacent arch. The person who dumped the torso was almost certainly oblivious to them, unless they were snoring very loudly. Well, the first part wasn't discovered until it had been in the Thames for an estimated two months, so not a bad job. If he'd taken precautions it might never have been found. Likewise, the Whitehall torso (and the leg even more so) might well have been lying in the vault where it was discovered for 8 weeks, according to Bond and Hebbert. Regarding Pinchin Street, a defensive dismemberer seeks to hide the crime. Placing a Torso in Pinchin Street, Whitechapel, during the Ripper scare, would have done the opposite: it could hardly fail but attract widespread publuc attention. The drunks said that the body wasn't there when they arrived, so they must have had some awareness of the general surroundings. The man who found the Whitehall Torso said that he would have noticed if it had been there when he was last in the vault 3 days earlier, so the assertion that it could have veen there for 8 weeks seems quite bizarre. And how on earth was placing a corpse in the police's new headquarters not drawing attention to the crime? You cannot dismiss the suggestion that these torsos did not come from a medical facility at some point in time. The fact that there were never any heads found is another pointer to medical use of organs/bodies along with the fact that no specific causes of death could be found with the majority of the torsos. 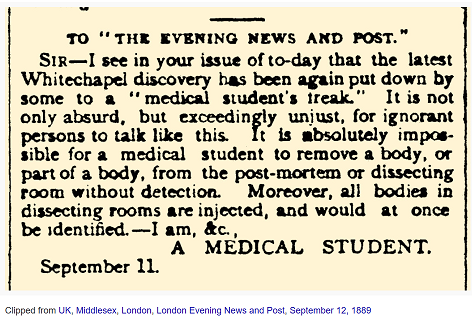 But there would be a risk factor to whoever was wanting to hide or dispose of body parts, be that killer,medical student, undertaker, or abortionist, there are a number of newspaper articles that have been published with regards to body parts turning up here there and everywhere where it is sugggsted that these were left as a prank by medical students, now that tells me that there is no smoke without fire and that the newspapers back them didn't just invent these theories. 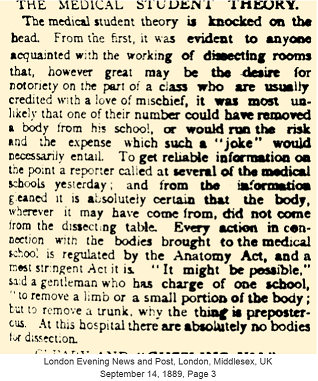 The suggestion that it was a prank by medical students is without foundation; it was simply speculation. Nor, as far as I'm aware, is there any precedence. Placing the Whitehall Torso in the vault would be a crazy thing for a defensive dismemberer to do, considering that such individuals attempt to dispose of the remains as expeditiously as possible. Ditto the scattering of Jackson's body parts. For obvious reasons, such an individual is not going to want to draw attention to their crime. Placing a Torso in the police's own headquarters, scattering body parts without any attempt to hide them, placing a Torso in Whitechapel during the Ripper scare, close to where Stride was murdered, and close to the anniversary of Chapman's murder-she may have been killed on the day of the anniversary-was hardly going to achieve this aim. Last edited by John G; 04-17-2019, 07:35 AM. The anatomical specimen dumping to avoid funeral costs is the least plausible for me. We wouldn't suddenly get a cluster of females between the ages of 25 and 45 dumped in and around Chelsea Reach. Nothing before or after.